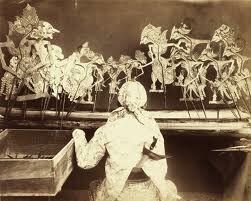 Wayang is a generic term denoting traditional theatre in Indonesia. There is no evidence that wayang existed before Hinduism came to Southeast Asia sometime in the first century CE, brought in by Indian traders. However, there very well may have been indigenous storytelling traditions that had a profound impact on the development of the traditional puppet theatre. The first record of a wayang performance is from an inscription dated 930 CE which says \”si Galigi mawayang,\” or \”Sir Galigi played wayang\”. From that time till today it seems certain features of traditional puppet theatre have remained. Galigi was an itinerant performer who was requested to perform for a special royal occasion. At that event he performed a story about the hero Bhima from the Mahabharata. Wayang Kulit plays are invariably based on romantic tales, especially adaptations of the classic Indian epics, \”The Mahabarata\” and \”The Ramayana\”. Some of the plays are also based on local happenings (current issues) or other local secular stories. It is up to the conductor or \”Tok Dalang\” to decide his direction. There is a family of characters in Javanese wayang called Punakawan; they are sometimes referred to as \”clown-servants\” because they normally are associated with the story\’s hero, and provide humorous and philosophical interludes. Semar is the father of Gareng (oldest son), Petruk, and Bagong (youngest son). These characters did not originate in the Hindu epics, but were added later, possibly to introduce mystical aspects of Islam into the Hindu-Javanese stories.3 They provide something akin to a political cabaret, dealing with gossip and contemporary affairs. The puppet figures themselves vary from place to place. In Central Java the city of Surakarta (Solo) is most famous and is the most commonly imitated style of puppets. Regional styles of shadow puppets can also be found in West Java, Banyumas, Cirebon, Semarang, and East Java. Bali produces more compact and naturalistic figures, and Lombok has figures representing real people. Often modern-world objects as bicycles, automobiles, airplanes and ships will be added for comic effect, but for the most part the traditional puppet designs have changed little in the last 300 years.